Some time last week, I was notified about a new Twitter follower called School Street Posters. It caught my attention for a few reasons: First, no one follows me on Twitter. 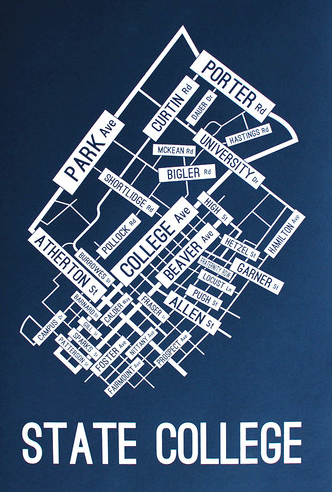 Second, it’s got a pretty cool street map of State College. And, finally, I already owned two similar posters, but for cities where I used to live, Philadelphia and Boston. Here was a graphic designer with a similar concept, but instead of city neighborhoods he’s diagramming the street maps of college towns. Smart. Although Eric Strand launched School Street Posters just last year, he’s already created screen prints for the entire Big Ten and Big 12 conferences, plus plenty of other schools. As for State College, they’re available in several colors, but we’re partial to the classic navy and white version. I’m thinking a campus map like this is much more accurate—and way prettier to look at—than the one I drew up for my dorm room my freshman year. Entry filed under: State College, University Park. Tags: Ork Posters, School Street Posters. Very Pin-worthy poster! Thank you Amy!